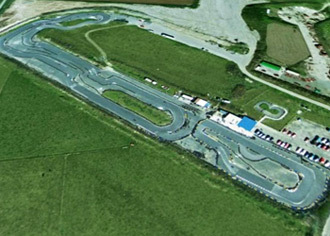 Located on the North Cornwall coast in between Newquay & Padstow St. Eval Kart Racing Circuit is the largest and most exiting race circuit in the South West. It is also the only one of its kind in Devon and Cornwall. The 1200 metre circuit has been designed with the assistance of some of the UK’s top racing drivers and constructed using the best materials available, resulting in the creation of a challenging venue for drivers who want to try their hand at the real thing. The Honda 270cc Powermax and 390cc Thunderkarts are well maintained and the track is unusual in that it is the only outdoor venue with a flyover. The track is conveniently close to Newquay Airport, roughly 3 miles and is open all year: Monday – Saturday 9.30am-dusk. 5 MILES At Indian Queens take the A39 Atlantic Highway towards Wadebridge, turn left off the A39 for St. Eval & Talskiddy. Follow the sign for St. Eval, once at St Eval drive through the village continuing on this road until you see St Eval Church, this will be on your right; continue approx 400m on, the Kart Track is located on the right at the left hand bend. Five laps practice plus a 15 lap race driving 390cc Thunderkarts (Please note that at least 12 drivers are required for an exclusive event). Non-exclusive races are run on Saturdays at 1045h and 1615h only. Five laps qualifying plus a 20 lap race driving 390cc Thunderkarts (Please note that at least 12 drivers are required for an exclusive event). Non-exclusive events are run on Saturdays ONLY at 1045h and 1615h.